‘I don’t like seafood’ is a common refrain that all of us will have heard at some point in our lives. In an odd twist for an island nation, we will all have at least one friend or family member that actively dislikes and avoids seafood – probably due to a traumatic incident in their past that almost no reasoned arguing or emotive pleading can overcome. On the off-chance that you can convince them to give seafood another go, finding a reasonably priced high-quality seafood restaurant in London is surprisingly hard following the demise of places such as Rex and Mariano. None of this is Orasay’s problem and they don’t pretend to be the answer. 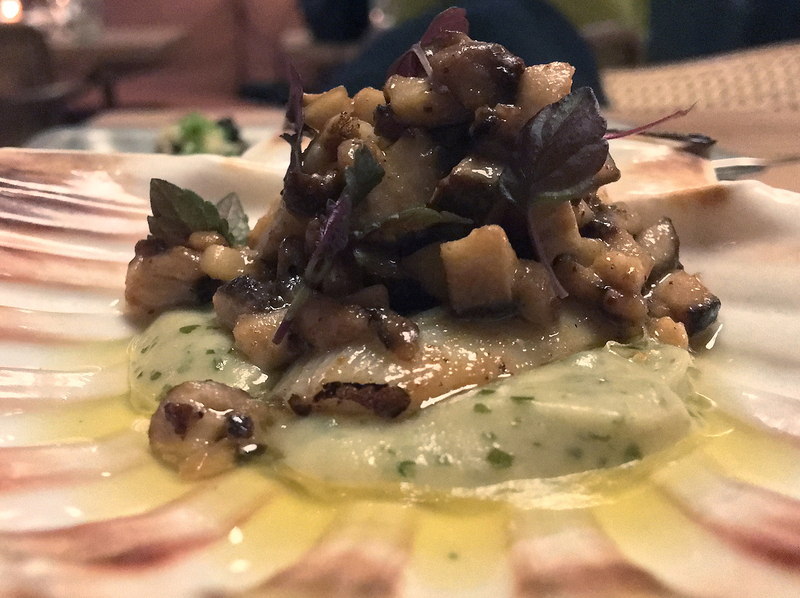 This latest restaurant from the chef-proprietors at St Leonards is just trying to make a living by serving dishes based around Scottish-sourced seafood to the wealthy locals and weirdly obsessive restaurant pests such as myself. But if you can convince your seafood-hating brethren to haul their sorry carcasses to this quiet part of Notting Hill, then you’ll find a restaurant that has a lot to offer on its relatively compact menu. The oysters at Orasay were far better than their equivalents at St Leonards, largely because the kitchen here has kept it simple. Plump and gently sweet with a hint of brininess, these silky little charmers had little need for the garnishes served on the side. 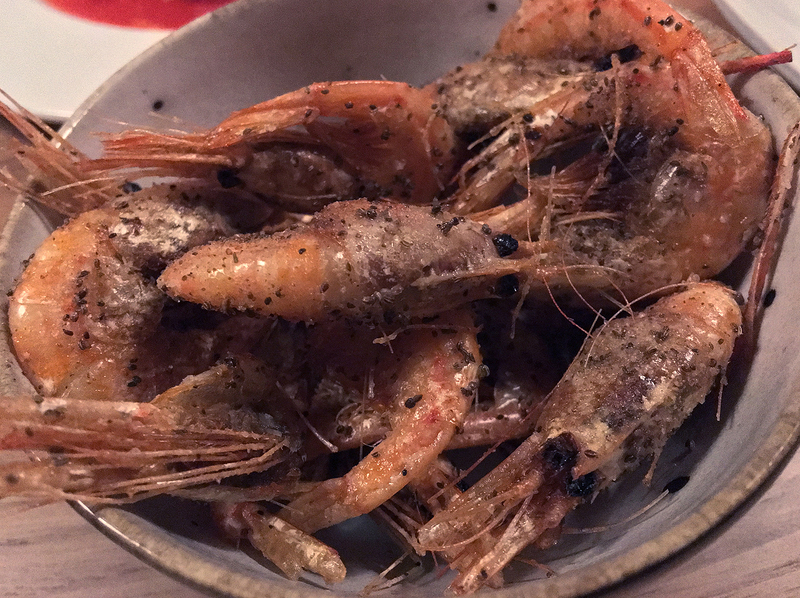 Fried shrimp were devoured whole, their edibly crunchy carapaces sensibly seasoned. The salty, peppery mouth-coating umami was cumulative, building up to a taste akin to glugging several mouthfuls of prawn bisque or pad thai stock. Delicious, but best order a palate cleanser for afterwards. The puffy, pillowy soft and effortlessly tearable pitta-esque pieces of bread came topped with reasonably fleshy and salty anchovies. While not lacking in salty umami, these little fishies still weren’t as potent as the very best Cantabrian anchovies. Even so, this combination of carbs and aquatic protein still had much to recommend it. Thin slices of glossy, meaty sea bream crudo were effective conveyors for the distinctive sweetness of Sicilian blood orange alongside fruity olive oil, crisp radishes and bittersweet chicory-like greens. 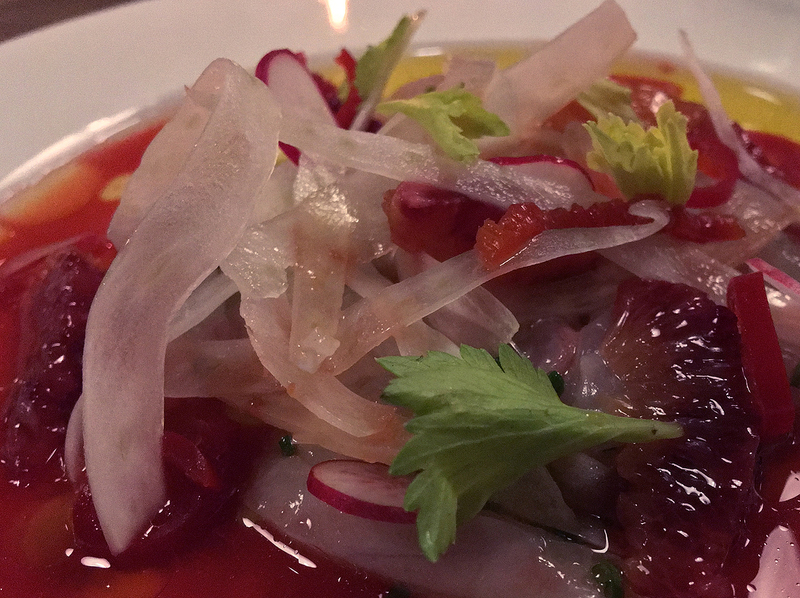 This highly credible crudo wouldn’t be out of place in an Italian seafood restaurant, such as Rome’s Il Sanlorenzo. To the barking Sloaney beardos at the next table: please learn to use your indoor voices. Kthxbai. 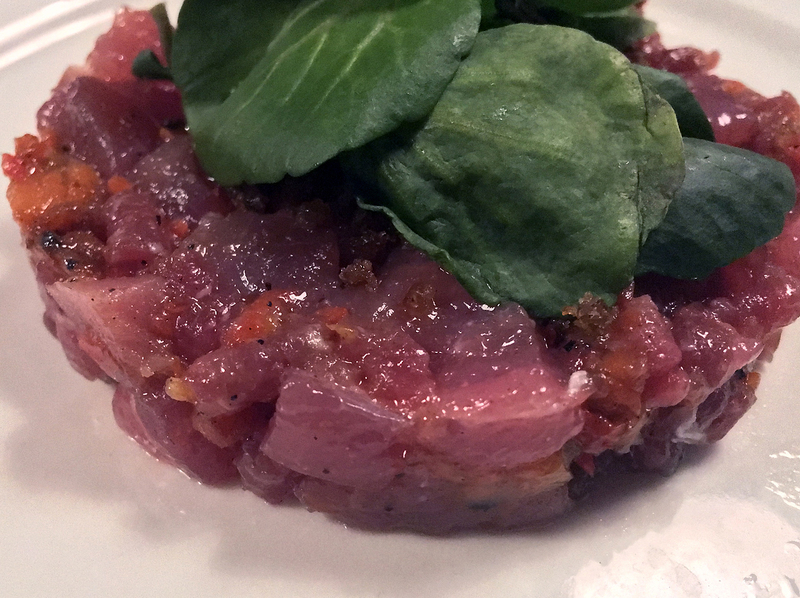 Although meaty, the tuna and beef tartare was neither one thing nor the other. A curious combination that was ultimately ineffective and unmemorable. Any restaurant that has Joni Mitchell on its soundtrack is already doing something right. 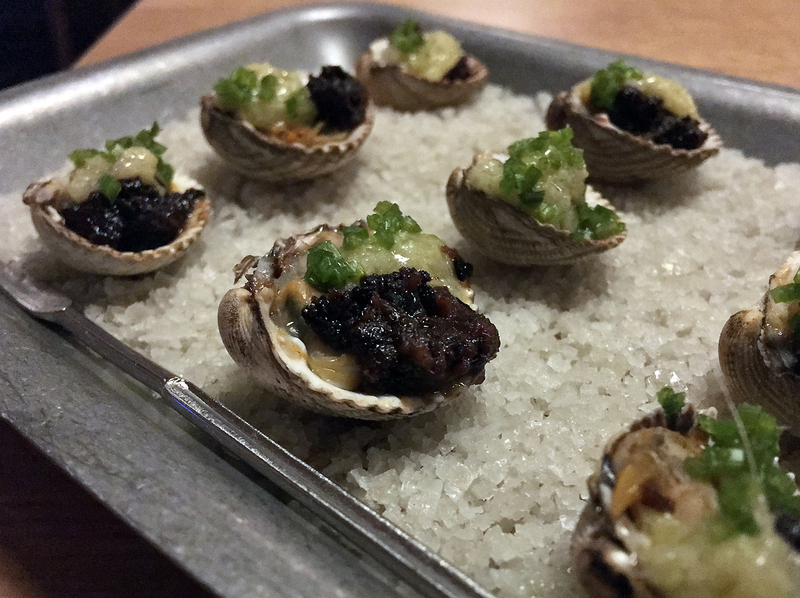 Although drawn and quartered, the sliced scallop still retained its plump meatiness. Even better was the buttery rich emulsion oozing over the scallop’s curves, its hollandaise-like charms bolstered even further by the sweet undertones of what appeared to be dill. It was so delicious, I licked the shell clean. 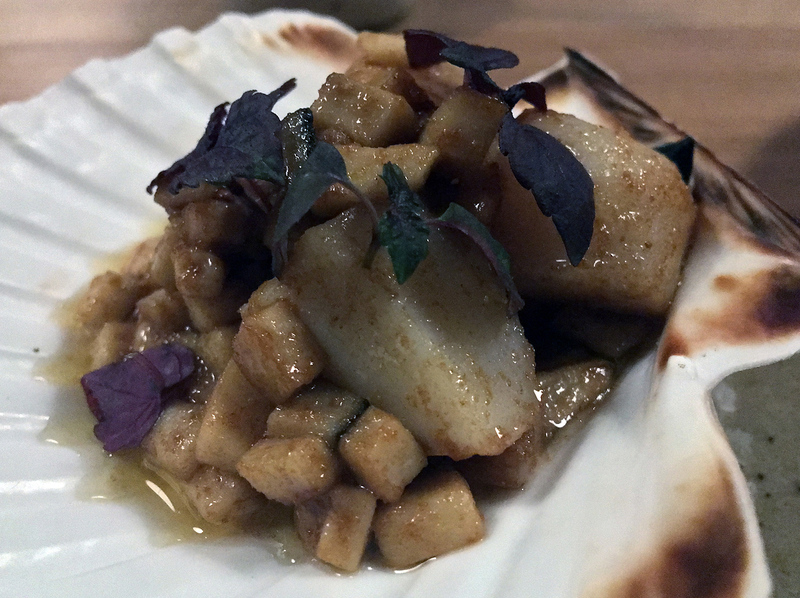 The scallop’s superlative charms were just as sublime on a subsequent visit. This wouldn’t be a somewhat Scottish seafood restaurant without smoked salmon. The version here was as far removed from the often dire supermarket versions of smoked salmon as it’s possible to get. 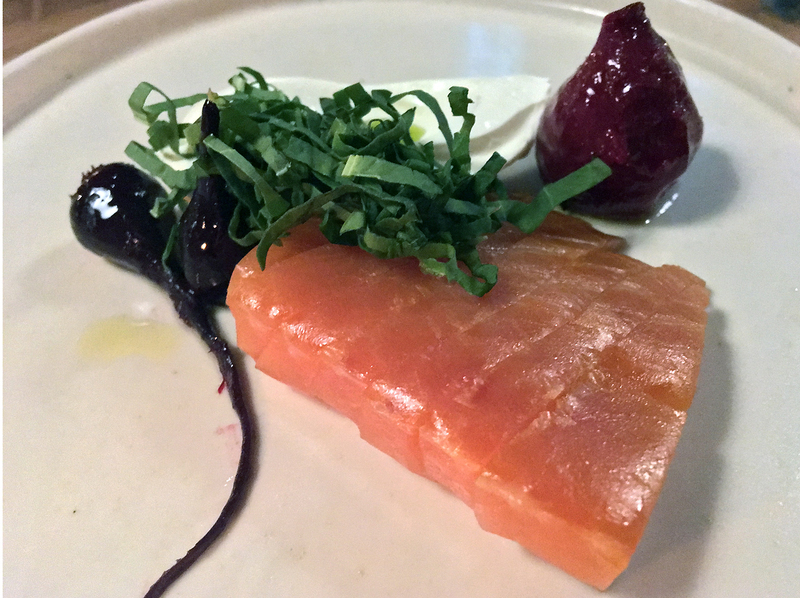 Glossy, grease-free and meaty, each sashimi-esque cut was tinged with the gentle but distinct earthiness of beetroot, a quality boosted by the sticky pieces of candied beetroot to the side. 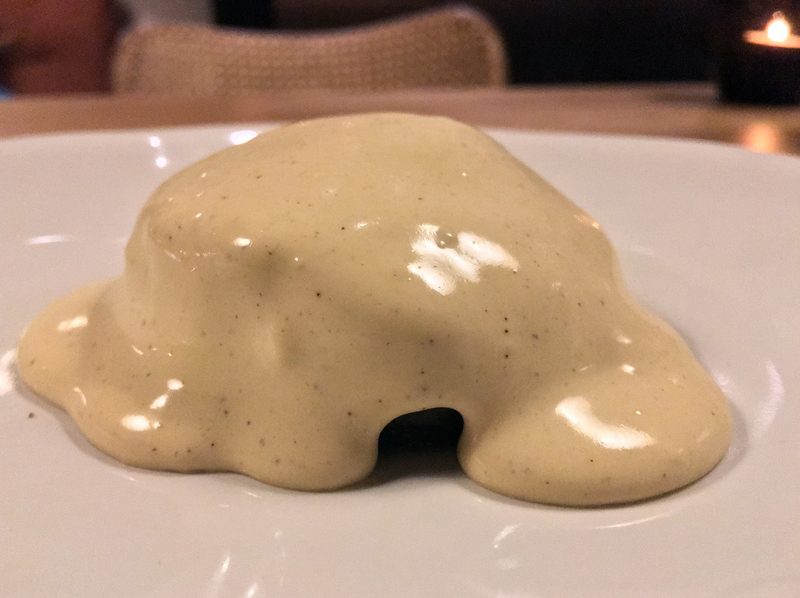 Although not strictly necessary, the thick and milky crème fraiche on the side was still welcome – especially with its unexpectedly clean aftertaste. The dishwasher by the wine rack in the dining room wasn’t too obtrusive overall, but it’s still incongruously placed. Pork and crab agnolotti was surprisingly shrug-inducing, both inside and out, but it was a different story for everything else on this plate. Shreds of crab were pleasingly milky, segueing surprisingly neatly into the subtly seductive charms of the dashi-like stock. Both were even more charming when taken with the crisp bittersweet vegetal garnishes. It’s an odd pasta dish were the filled pasta is upstaged by everything else. But I’ll take it anyway. 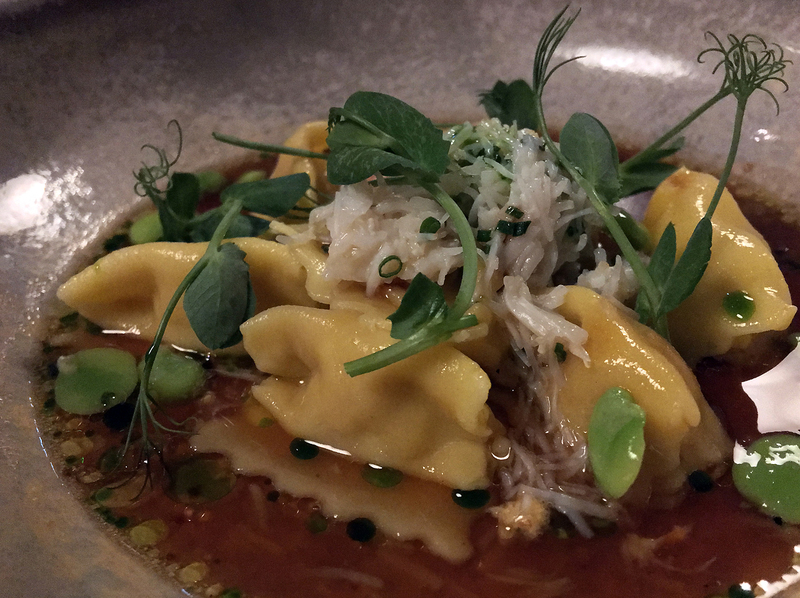 Given the surge in both high-quality pasta and pork-crab dumplings in London recently, this agnolotti was surprisingly subpar. The combination of smoked ham and burnt chilli was, given its constituent ingredients, unsurprisingly reminiscent of XO sauce. This pairing needed a better conveyor than the bitty and gritty cockles though. Although pleasingly briney, the challenging texture left much to be desired. One of my earliest memories is scoffing a styrofoam cup of cockles at one of London’s weekend markets. If only these cockles had been as pleasurable. There were no surprises with the bitter leaves, with the partial exception of a citrusy grapefruit-like dressing that only served to emphasise the refreshing qualities of these leaves. An essential accompaniment to some of the richer main dishes on the menu. 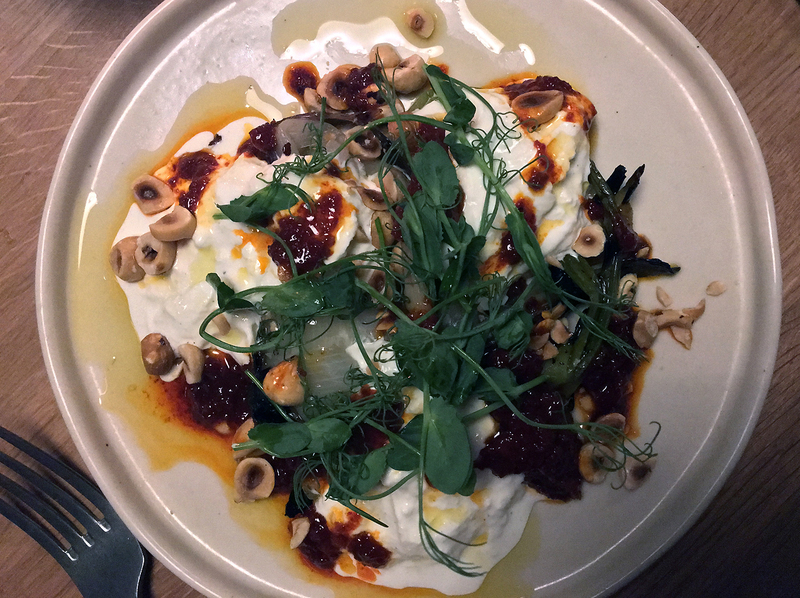 The buffalo curd’s milky, burrata-liked charms contrasted neatly with the oozing spice of nduja and the sweet, chewy, leek-like onions. The crunch and nutty pop of hazelnuts proved to be surprisingly complimentary to the dairy-meat-veg triumvirate. Although the nduja wasn’t as meaty as the variety often served at Lina Stores, this boldly flavoured starter was still eminently delightful. A private downstairs dining room is apparently in the works. 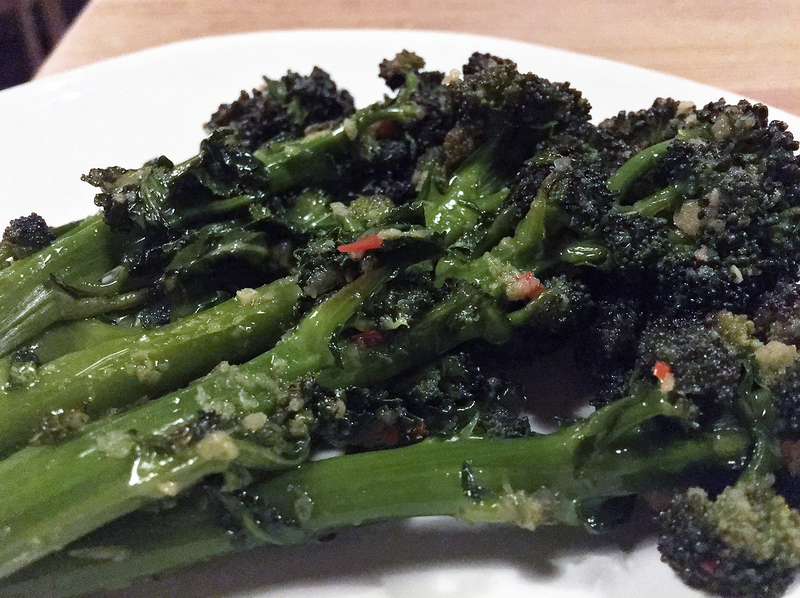 Purple sprouting broccoli was a bit too soft for my liking, but the restrained seasoning and gentle spicy heat meant this side was still distinctly pleasurable. The selection of seafood mains at Orasay appears strikingly unadventurous at first glance. Especially so when there are just two of them, outnumbered by the two red meat and two vegetarian mains. 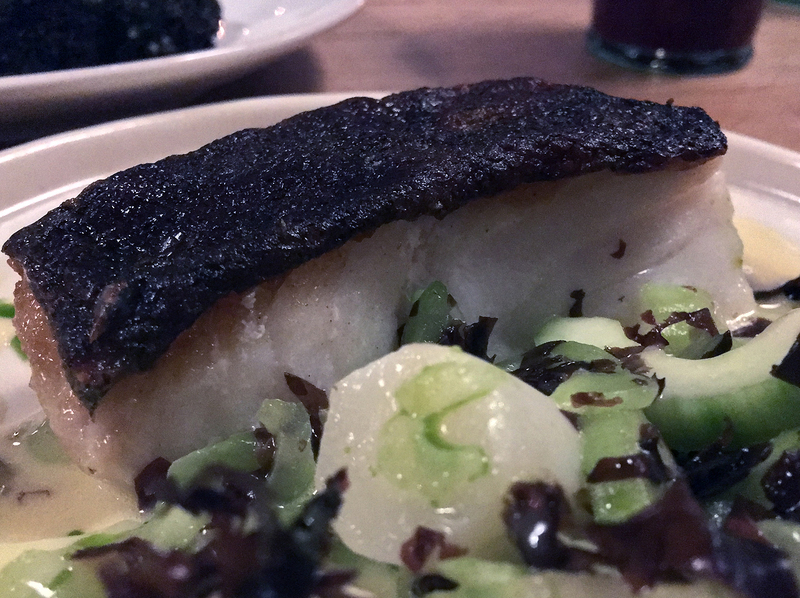 The brill should not be underestimated though, not when its meaty impersonation of lobster could give both the crustacean itself and turbot a run for their money. The flat fish, the briney clams and the vegetables were bound together in a curry-like sauce. Despite its wan thinness, it was a winsomely flavoursome thing tinged with what tasted like mustard and curry leaf. 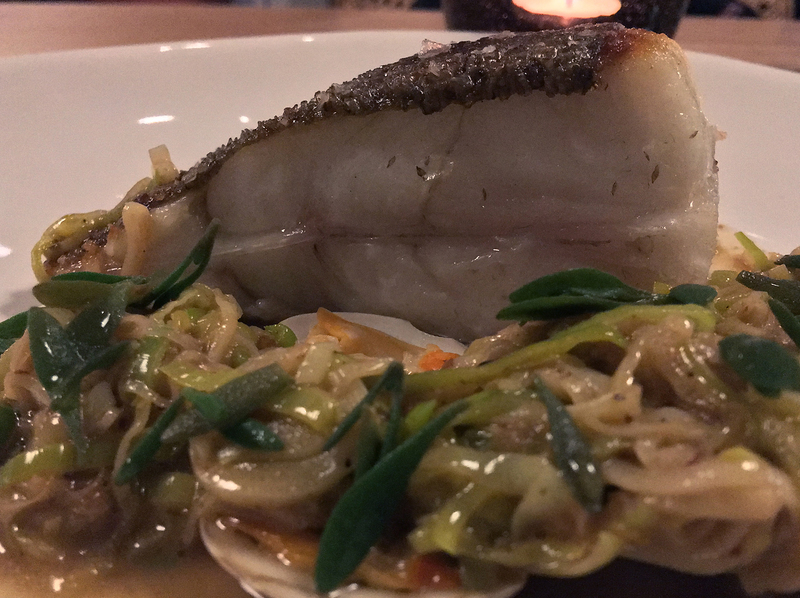 Its umami seeped into both the crisp skin of the fish and its soft, supple underbelly. Combined with the textural beauty of the fish, it made for an exceptionally elegant yet still distinctively characterful dish. Meaty, flaky cod had been cooked just-so, the crispiness of its skin perfectly even. 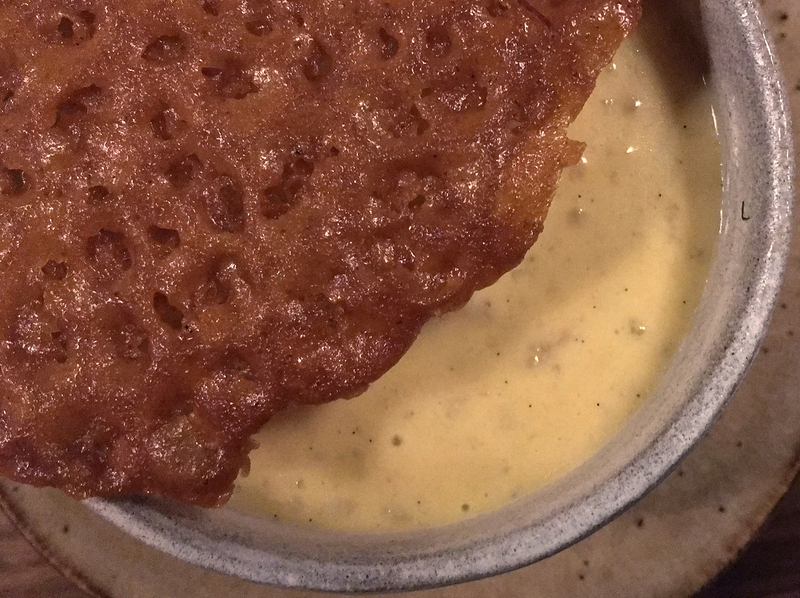 The sauce took the fish to an even higher level though with its subtle, layered sophistication – sweet, milky, lightly herbal and eminently moreish. If the drab cod of my misbegotten childhood had been as good as this, then I would have gladly scarfed it up. Rather than needing to have it force fed down my gullet. At the time of writing the beef short rib is only available in a chunky 850g portion, so it’s best enjoyed with someone who enjoys gobbling an indecent hunk of meat such as myself or The Amazon. 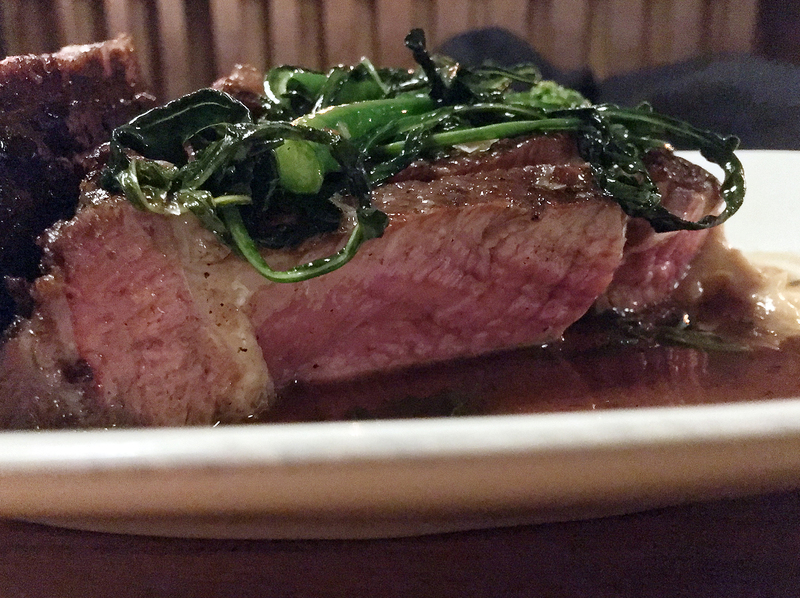 I’ve never encountered short rib served medium rare before – if I had to guess, I’d say it had been cooked sous vide over a long period before being finished in a pan or on a grill. The latter would explain the almost perfect maillard effect, with the browning of the crust remarkably even all over. Underneath that chocolate brown crust was a glorious mosaic of exquisitely tender meat alongside gently rendered fat and connective tissue. Glistening imperial purple, shimmering pink and marble white – this was a dish that, for once, tasted as good as it looked with a subtle sweetness and meaty tang. It was made even more delectable by the hazelnut-like charms of the Jerusalem artichoke reduction and the samphire-like saltiness of the greens. 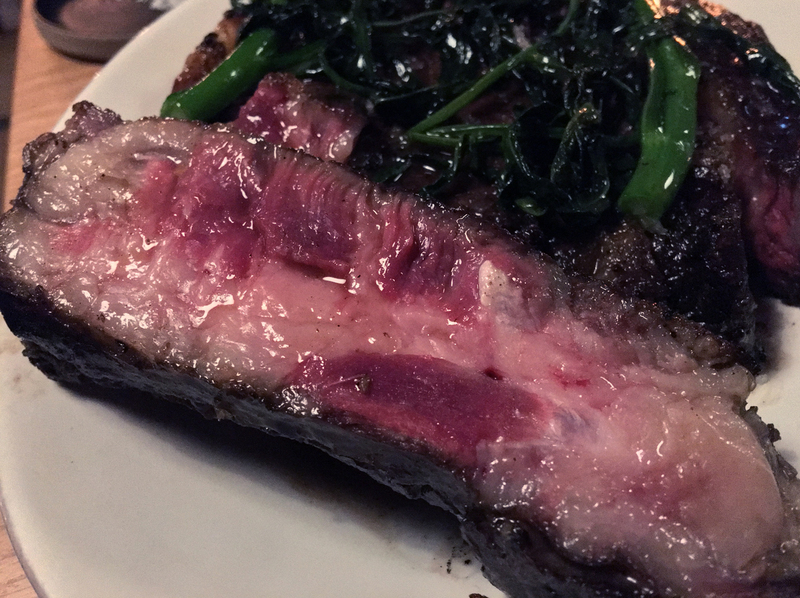 I never thought I’d find another beef short rib dish superlative enough to rival what Texan-style barbecue has to offer, especially in Notting Hill of all places! But then life is full of surprises. Few other muscular hunks can arouse my primal lust as much as this one. A more representative shot of what the beef short rib actually looks like as you’re scoffing it. 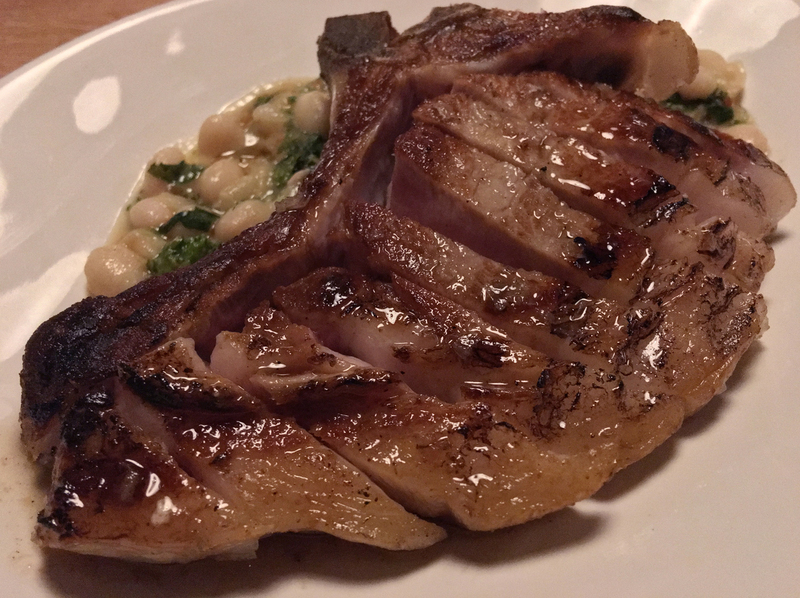 The pork chop wasn’t anywhere as successful as the beef short rib, due in large part to the fatty but otherwise surprisingly dull meat. 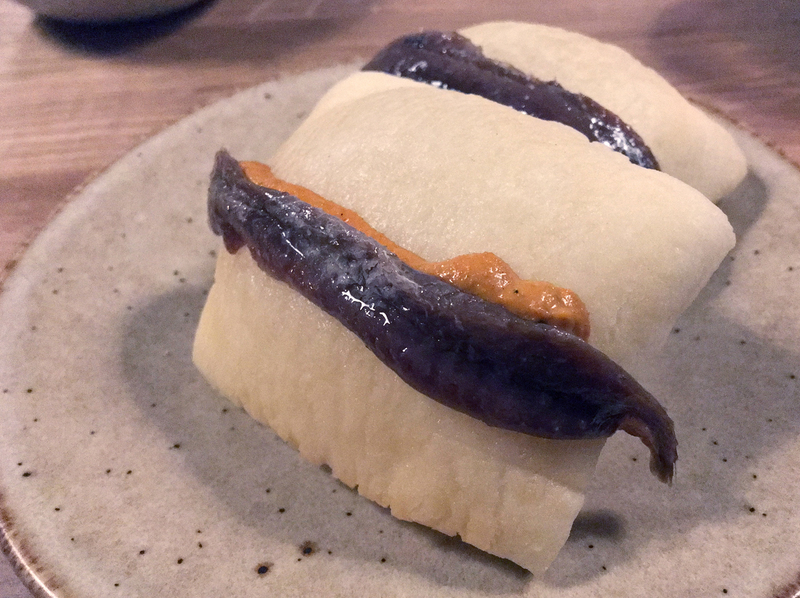 There was still plenty to enjoy in this dish though, with the buttery beans and bitter turnip tops bound together in a sticky sauce richly endowed with a buttery umami. I’d have sacrificed the pork for more of the veg-in-sauce. There’s something about the curvature of the fat that somehow evokes a fish, even though it obviously isn’t. Rice pudding served at room temperature sounds like the sort of food you might be offered by a cute but oafishly dim godchild, but this dessert should not be passed up lightly. The smooth, creamy pudding hid a layer of rhubarb compote that captured the bold tart sweetness of the vegetable, although the absence of extant stalks meant it lacked their textural charms. The crunchy, sticky honeycomb-like wafer can be put to good use as a deliciously edible scoop or as a crumbled topping. The flourless chocolate cake doesn’t look like much, but its bittersweet qualities, while modest, still meant it was already umpteen times better than most of the shop-bought chocolate cake in this country. Its dark chocolate charms were bolstered further by an added maltiness, that odd coffee flavour you only ever get in coffee-flavoured sweets rather than the drink itself and a thick, mouth-coating cream. If nothing else, the anti-Instagramness of this dessert pleases me. 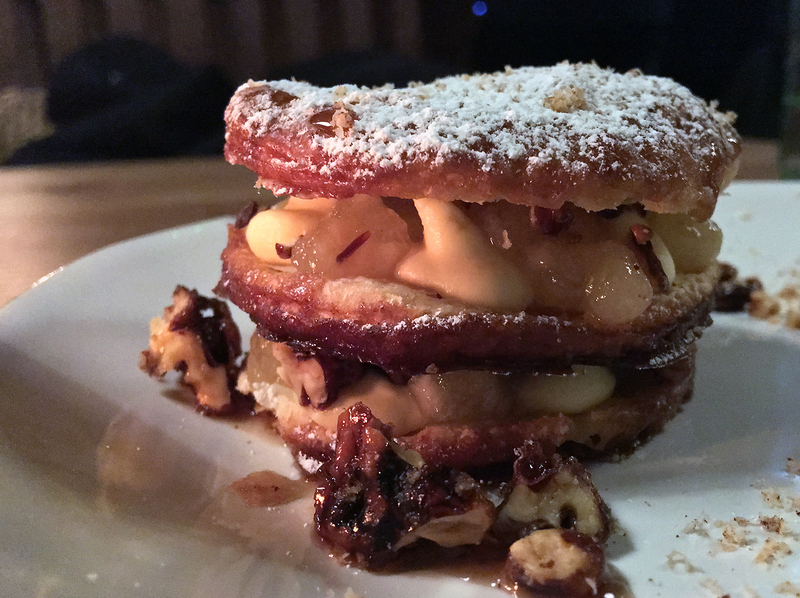 The crisp and crunchy butterfly wafers of the mille feuille alternated with the tart sourness of diced pears and the nutty sugariness of candied walnuts. A milky cream bound all three together, the finishing touch on a satisfying dessert that didn’t leave me feeling bloated. This review’s procrastination was brought to you, in part, by 2WEI and Deep Purple. It would’ve been a surprise bonus if Orasay had turned out to be the next Rex and Mariano, but I fear we’ll never see the likes of the latter again in this town. Not when seafood prices continue to rise and the latent conservatism in so many people’s palates continues to drive them away from the sea’s bounty. If you’ve already developed a taste for the sea though, or know someone who is close to doing so and needs just a little nudge towards enlightenment, then you must set sail immediately for Orasay’s calm, dignified and polished dining room. 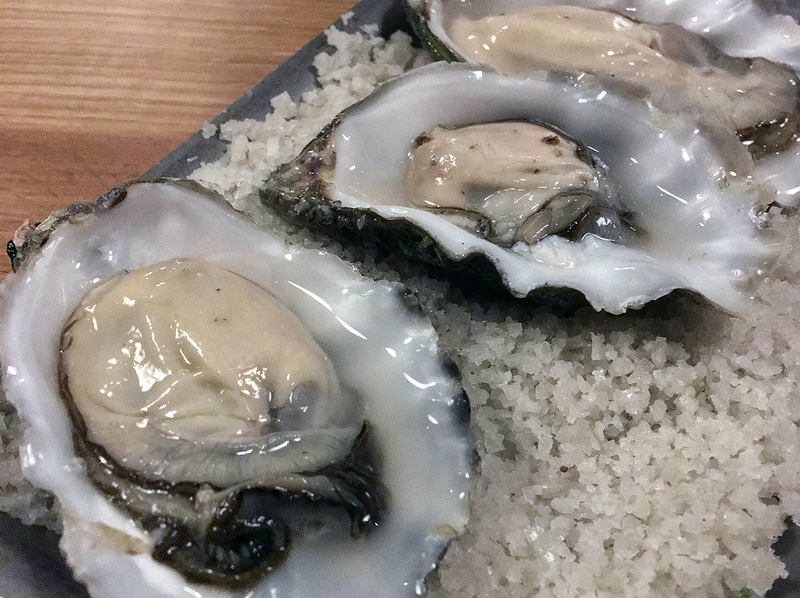 Unlike other seafood restaurants that plumb squalid new depths with their lack of imagination and dire execution, Orasay doesn’t attempt to cover every hoary aquatic cliché and classic. Instead, the kitchen does just a few things and, for the most part, it does them with precision, verve and quiet confidence. Plus, service is already far more friendly and efficient then St Leonard’s was at this stage. The question at hand isn’t whether Orasay is charming and accomplished; it’s whether or not it can get even better. I can’t wait to find out. Opening Hours: Tuesday-Wednesday 18.00-21.30. Thursday-Saturday noon-14.30 and 18.00-21.30. Sunday noon-14.30. Closed Monday. Average cost for one person including soft drinks: £60-70 approx. 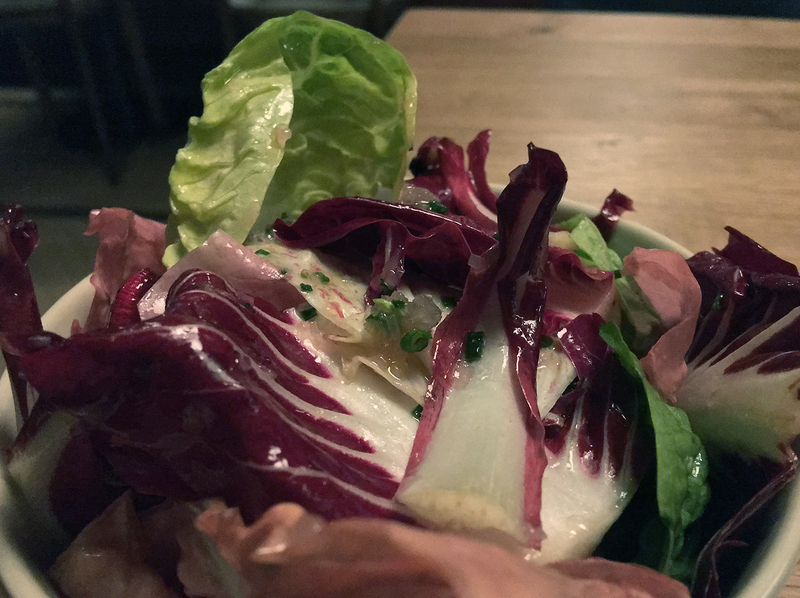 Tags: anchovies, artichoke, beef, beetroot, bread, brill, broccoli, cake, chocolate, cockles, cod, crudo, curd, curry, fish, london, mille feuille, mushroom, nduja, notting hill, orasay, oysters, pasta, pork, raw, restaurant, review, rice pudding, scallop, sea bream, short rib, shrimp, smoked salmon, st leonards, tartare, tuna. Bookmark the permalink.